2. Look at some examples to get a feel for the range of asking prices per square metre. There is a whole section on our blog offering guidance on buying plots. Location: Let me walk you through some of the areas from La Herradura in the East to Sotogrande in the West. Think of this as a beginner’s guide. If you are interested in any of these give me a call. We do a free site appraisal before you buy. As a broad generalisation the further away from the international airport at Malaga you go and the further inland you go the less expensive the land is. As you would expect it is far from an even distribution and local factors will override this principal. In fact as I say later it gets more expensive between Malaga and Marbella the closer to get to Marbella. West of Malaga is considered nicer than East of Malaga but there are oasis of niceness in Nerja and the relatively unknown La Herradura on the Costa Tropical. In my opinion La Herradura represents great value for money. It might not have the cache of Marbella but it is beautiful, peaceful, low density low rise and only an hour from Malaga airport. The same is true of the zone to the West of Nueva Andalucia……but let us work our way East to West. My English teacher at school said we were not allowed to use the N word so, if you’re ok with it, as a tribute to Mrs Collier, we will no longer use the word “Nice”. I have just looked up a plot for sale in La Punta de La Mona (quite posh!). It’s priced at 680,000€ and its 1,600 sq m which is 425€ psm. It has sea views. Malaga itself is often not taken seriously by foreigners because it is a busy commercial port and industrial hub. However, Malaga city itself is charming and, not far away, there are some up-market estates to the East of the city. The best plots can look down over the harbour with magnificent view along the coastline. The beach here, Pedregalejo, is one of my favourites because of the long line of first class fresh fish restaurants, along the beach front, roasting sardines against open fires. 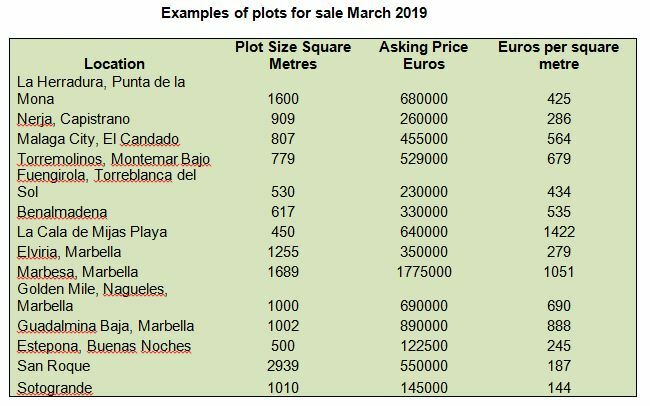 As a broad generalisation, and contradicting what I said about land further away from the airport being cheaper, I would say prices per square metre increase between Malaga and Marbella. To the immediate West of Malaga: Torremolinos, Fuengirola, and Benalmadena, have a reputation as busy summer resorts. A client of ours recently bought a plot in the centre of Torremolinos within walking distance of the railway station so he can easily commute to the airport. Inland from Mijas, Mijas Pueblo, La Cala de Mijas Golf are a good many plots. Some of this is low density which is comfortable but infrastructure such as shops restaurants medical facilities and schools can be poor. From Mijas to Marbella there are lots of popular up market estates such as Cabopino, Elviria, Marbesa, El Rosario, and El Real. The cache of a Marbella location increases along with prices as you approach Marbella town. From Marbella going West, the Golden Mile and Nueva Andalucia continue to be popular. The Golden Mile is an informal name for the region from Marbella going West to Puerto Banus. On the beach side it’s pretty exclusive. We have done complete renovations in Guadalmina and Cortijo Blanco. These estates are low rise, quiet, walkable to the beach, and expensive. Inland there are some low density low rise estates with beautiful natural settings, mountain and sea views and lots of trees. I am thinking particularly of El Madroñal in Benahavis but there are others. La Zagaleta is often described as the most exclusive estate in Europe and by reputation seems to be populated with footballers, pop stars, actors and politicians. Quite how the politicians can afford it beats me but Mr Putin is reputed to me amongst them. You will be in much better company in El Madroñal where you may bump into several clients of ours. Further West I have to say its gets increasingly more interesting. The prices fall, the facilities are to all intents and purposes the same although without the cache. You will find, peaceful estates, low rise, low density and with sea views. San Roque and Sotogrande: Sotogrande is much sort after with its horse-riding, polo, international school, and marina. Which side of the AP7? The AP7 is the motorway toll road that allows rapid access to the whole region. Generally to the south, the beach side, development is higher density, the beach is closer and prices are higher. To the North or inland, the views are more distant but can still be spectacular. Something next to or close to the beach will be very expensive. A mature well established estate or a new one? Prices are higher in mature well established estates that are older and probably have more trees. By contrast a new estate can be fairly barren. Developers are obliged to put in the roads, pavements, street lighting even the playgrounds before they can start building so you may see the estate infrastructure in place but no houses. If you buy a plot on a new estate the price might well be a lot cheaper but when you have finished your house you may have building works going on all around you for years. How Much is a View? The other day we looked at a villa in Los Flamingos. As you walked into the house you were hit by this extraordinary view. (This “wow” effect is something our clients ask us for where the conditions permit it.) The visual effect was extraordinary because, through the glass walls and over the infinity pool, the land fell away steeply and the views were all embracing. There were several people prepared to pay millions or seemingly whatever was asked for that view. We guessed from comparing prices that they view was worth possibly 1.5M€. Sometimes I think the view is everything. Certainly when we are designing are houses we think this and maximising the view from the house is a key priority. Estate agents refer to properties as being front line golf. The term comes originally from being front line to the beach where you might expect to pay 30% more for a front line sea view. Now they talk about being front line to the manicured golf course. There is certainly an aesthetic advantage to this as the courses are beautifully looked after. Presumably there is also some risk from itinerant golf balls! Urbano or Rustico: It’s important to understand that land classified as “urbano” in the Spanish planning system means that, providing you satisfy the rules, you will get a building licence. So land that is classified “urbano” in a countryside setting is particularly desirable. Forget about building on land classified as “rustico” in Andalucia. A refurbishment or renovation maybe but not a new build. The 2010 plan (PGOU) of the Marbella town hall was annulled in 2015. This is the plan for the area around Marbella which determines where you can build and where you cant. The 2010 plan had attempted to resolve the many “illegal” developments that had been approved over the previous 20 or so years but the Spanish Supreme Court annulled it. Consequently, the legal status of a plot is established by the 1986 plan until a new general plan is prepared and approved by the Ayuntamiento of Marbella and the Junta de Andalucía. It’s critical to establish your plots legal status before you buy. Independently of this, where you are entitled to a building licence, it takes anything between 1 and 3 years to get one from Marbella town hall. No-one really knows how long it takes. Opinions are voiced and the mayor makes declarations but obviously Marbella town hall’s slowness is a major consideration when evaluating a plot within that area.